Northern Lights Fireworks are an award winning pyrotechnics company that have been providing professional fireworks displays of the highest quality since 1995. We also have a shop that is licensed to sell fireworks all year round. With an established reputation for excellence, Northern Lights fire displays for all occasions at stately homes, private houses, golf and country clubs and hotels all across the UK. As one of the UK's most exciting and innovative firework display companies Northern Lights is the only fireworks company to have won both the British Fireworks Championship in 1998 and the British Musical Fireworks Championship in both 2000 and 2001. 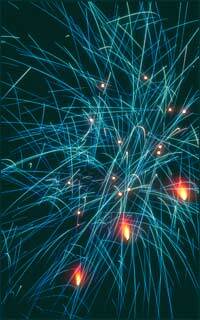 Northern Lights are members of the British Pyrotechnics Association, the CBI Explosives Industry Group and the FSB.